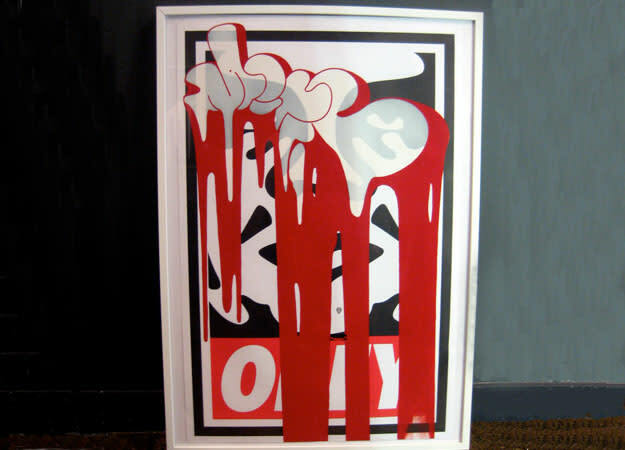 "MIRF x OBEY references 'Erased' by Robert Rauschenberg. Rauschenberg approached William de Kooning, the reigning king of modernism, and asked him if he would consider giving him one of his works for Rauschenberg to erase. It became a conceptual masterpiece, almost as strong as 'The Black Square' by Kazimir Malevich. The idea of erasure and destruction is relevant when we look at street art and graffiti. When Shepard came to do his installation on Houston and Bowery, it got 'vandalized' before it was even finished. Over the next couple of months, it took a real beating after his exhibit opened at Dietch. It was looking too pretty, too gallery, too glossy. The community didn't like it and reacted. That's what graffiti is about. Street art is a lot nicer. There is no beef, no wars, no criticism. We have been inspired by Shepard and in our eyes this piece is not about disrespect, but about the conversation between street art and graffiti, the honesty of the streets and collaboration between artists."